Winter is just around the corner and, with gas prices still unstable, it's now even more important to monitor your thermostat. That's tough and annoying though, which is why gadgets like Ecobee are coming out on the market. 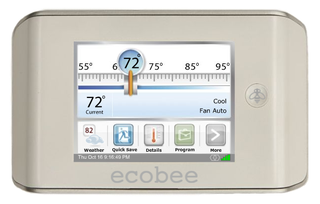 Ecobee has an integrated programmable smart thermostat with a WiFi-enabled touchscreen that automatically sets your household to conserve energy at the press of a button.